After you start your marketing automation, you can continue to edit the automation and the emails it contains. Pause emails in an automation to edit their triggers, schedules, content, and more. In this article, you'll learn how to make changes to emails in an automation. To learn how to add or reorder emails, view Edit an Active Automation. When you pause a single email in an activity-based automation, other emails in the automation continue to send as expected. We'll hold contacts in the paused email's queue. When you resume the email, those contacts will continue through the automation. Date-based automations allow contacts to move in and out of queues, depending on their eligibility and your delivery settings. If the automation or email is paused on the date a contact is scheduled to receive an email, the contact misses that email and moves into the next email queue in the automation. While an email is paused, you can make changes to its template, content, and trigger, as well as its scheduling, post-sending actions, and segmentation settings. To pause and resume an email, follow these steps. Find the email you want to pause and click Pause & Edit. You'll need to resume the email before it will send to queued subscribers again. To resume an email, click the drop-down menu and choose Resume. 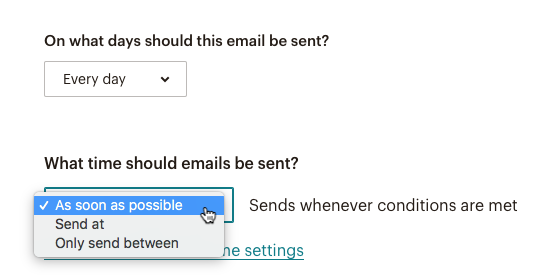 From the Emails step of the Automation builder, click the provided link to edit each email's trigger, schedule, segment, actions, and content. You can only edit draft or paused emails. Each email in an automation has its own trigger, with a delay time and settings specific to each trigger type. After you choose an automation type, you can edit each email trigger to create a more precise path for subscribers in your automation. To edit an email trigger, follow these steps. Pause the email you want to work with. From the Edit Trigger pop-up modal, you can also adjust Delay and other trigger Settings. On the Select a new trigger screen, choose from a selection of tabs for Workflow activity, E-commerce, Campaign activity, List management, or Integrations. Choose the trigger you want. Some triggers will only be available with certain add-ons, audience settings, or integrations. Update the delay and settings for the new trigger. Return to the Emails step of the Automation Builder, click the drop-down menu and choose Resume. The schedule setting determines the days an email is delivered, as well as what time delivery occurs on each day. To edit an email schedule, follow these steps. In the pop-up modal, choose the options you want from each drop-down menu. 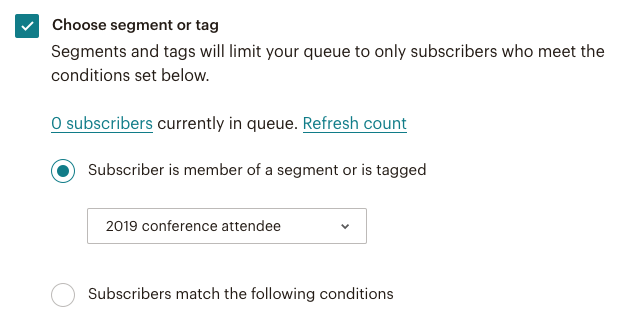 If you want to further target and filter subscribers in an automation, you can change the segment or tag for each email. To edit an email segment or tag, follow these steps. Next to Filter by segment or tag, click Edit. In the pop-up modal, check Choose segment or tag and choose from an existing segments and tags, or create a new segment. You can set a post-sending action for each subscriber after the automation email is sent to them, like adding them to a group. To edit an email's post-sending action, follow these steps. Click Edit next to Post-send action. Check Choose post-sending list action and change the action as needed. 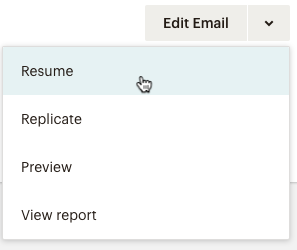 Return to the Emails step of the automation builder, and click the drop-down menu and choose Resume. To edit an email's content, pause the email you want to work with and click Edit Email. Navigate through the steps of the Email Designer to make changes, and click Save and Return to Workflow after you're finished. You can delete a single draft or paused email from any automation. 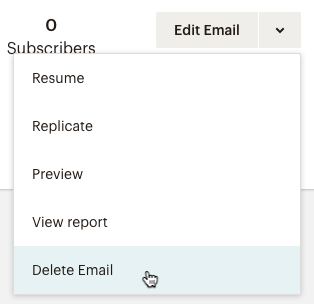 When you delete an email, its associated statistics will continue to appear in the automation report under Deleted Workflow Emails, but the individual email report will be removed from your account. Subsequent emails in an automation will move up in the timeline. This means that subscribers in the queue for the deleted email will receive the next email in the series, as long as they meet its segmenting conditions. To delete a draft or paused email from an automation, follow these steps. Click the drop-down menu next to the email you want to delete and choose Delete email. In the Are you sure? pop-up modal, type DELETE in all caps, and click Delete. Learn how to pause, resume, edit, reorder, add, or delete emails in an automation.